Dinner-party ready and perfect for everyday meals, a whole fish roasted in salt puts "wow" on the table. 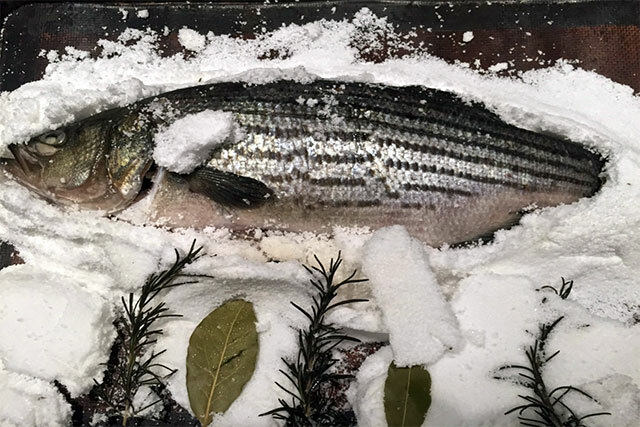 A whole fish cooked inside a dome of kosher salt looks beautiful and is easy to make. Ten minutes to prep, 30 minutes in the oven, a salt-roasted fish on your table will make everyone happy. Using whole fish costs less per pound than filleted fish. Cocooned inside its salt blanket, the protein-rich fish cooks in its own juices. The technique is very low-tech. No fancy machines or tools are required. Some recipes call for egg whites and water to moisten the salt, but from my experience, water alone works perfectly. 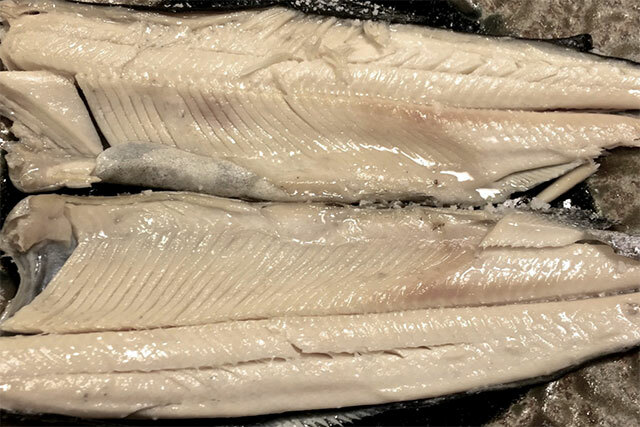 After the fish has cooked inside the coating of moistened salt, a fork will effortlessly peel back the skin and a chef's knife easily separates the meat from the bones. When creating the salt coating, it is important to use kosher salt. Do not use table salt and definitely do not use salt that has been treated with iodine, which has an unpleasant minerality. When you buy the fish, ask to have the guts and gills removed but there is no need to have the fish scaled because the skin will be removed before serving. If the only whole fish available in your seafood market is larger than you need, a piece without the head or tail can still be used. To protect the flesh, place a small piece of parchment paper across the cut end, then pack the moistened kosher salt on all the sides to completely seal the fish. Even though the fish is cooked inside salt, the flesh never touches the salt. The result is moist, delicate meat. After removing the salt-roasted fish from the oven, let it rest on the table on a heat-proof trivet. The sight of the pure white mound, warm to the touch and concealing a hidden treat is a delight. What kind of fish to use? So far I have used the technique on trout, salmon, sea bass, salmon trout and pompano with equally good results. This makes me think that the technique can be used with any fish. Choose a fish that is as fresh as possible, with a clean smell and clear eyes. When you press the body, the flesh should spring back. The cooking time will vary depending on the size and thickness of the fish. In general, a whole fish weighing 3 to 5 pounds will require a three-pound box of kosher salt. Since that is an estimate, it is a good idea to have a second box of kosher salt on hand. Personally, I prefer Diamond Crystal kosher salt because it is additive-free. Use only enough water to moisten the kosher salt so the grains stick together. Too much water will create a slurry, which will slide off the fish. Because kosher salt is not inexpensive, use only as much as you need. A quarter-inch coating around the fish is sufficient. Placing herbs and aromatics inside the fish's cavity can impart flavor and appealing aromas when the salt dome is removed. Sliced fresh lemons, rosemary sprigs, parsley, cilantro, bay leaves or basil all add to the qualities of the dish but discard before platting. Depending on the density of the flesh, generally speaking, one pound of fish requires 10 minutes of cooking at 400 F.
The mild fish can be served with a tossed salad, pasta, rice or cooked vegetables. The fish goes well with freshly made tartar sauce, salsa verde, pesto, romesco, chermoula or pico de gallo. 2. Wash the fish inside and outside. Pat dry and set aside. 3. Pour 2 pounds of the kosher salt into a large bowl. Moisten with ½ cup water. Mix with your fingers. If needed, add more water a tablespoon at a time until the salt sticks together. 4. Select a baking tray that is 2 inches longer and wider than the fish. Line with parchment paper or a Silpat sheet. 5. Place a third of the moistened salt on the bottom of the lined baking tray. 6. Lay the whole fish on top of the salt. Place aromatics and lemon slices inside the fish, if desired. 7. Carefully mold the rest of the moistened salt over the entire fish. If more salt is needed, moisten an additional amount of salt. 8. Place the baking tray into the pre-heated oven. 9. After 30 minutes for a 3-pound fish and 50 minutes for a 5-pound fish, remove the baking tray from the oven and allow the fish to rest for 5 minutes. 10. Using a chef's knife, slice into the salt dome on the back side of the fish, along the fin line. Make another slice on the bottom of the fish. Lift the salt dome off the fish and discard. Using the knife, make a cut across the gills and the tail. Insert a fork under the skin and lift the skin separating it from the flesh. 11. Have a serving platter ready. Using the flat side of a chef's knife, slide the blade between the flesh and the skeleton along the fin line. Separate the flesh from the bones. Try as best you can to keep the entire side of the fish intact, but no worries if the flesh comes off in several pieces. When you place the flesh on the serving platter, you can reassemble the fillet. 12. Turn the fish over and repeat the process on the other side. 13. Discard the head, tail, bones and skin or reserve to make stock. If making stock, rinse all the parts to eliminate excess salt. Place into a pot, cover with water, simmer 30 minutes covered, strain and discard the bones, head, tail and skin. The stock can be frozen for later use. 14. Serve the fish at room temperature with sauces of your choice and side dishes.